Going to a Singapore Wedding! Yipee! One of my best friends, Misha is getting married on May 16 in Singapore. She works there and her h2B will work there soon too so they decided to get married in SG. I am so excited - one because she is getting married and I love her so dearly - and two because going to Singapore is a first for me. Can't wait! Oh wait, I need a dress! Another accomplishment - we booked Hizon's Catering last Feb 8. We attended their grand food tasting at Fernbrook on that same day and as usual, we enjoyed the food. We had them in one of our family event last year and the service was great. Lots of freebies too. My AE is Cynthia Macasaet and Planner is Cheska. We also considered Center Table Catering. We attended their food tasting at Fernbrook last Jan 24. Their set-up was very elegant. The Owners are really nice too. We did not book them because Jardonyx did not find their food tasty. He loved their desserts, though. Some of the freebies we got from Hizon's are upgrade of Beef Dish to Carving Station, Upgrage of Pork dish to Shrimp dish, Quesadilla Station for Cocktails, Pasta Bar, Salad Bar, Dessert Bar, Big Chocolate Fountain, Crepe Station, and Coffee Station. I Laaveeet! So, caterer - check! There are still lots on my list. Whew! I learned about Fernbrook Gardens in Portofino South, Daang Reyna, New Alabang for the first time in 2007. They were already accepting bookings even if Fernbrook was still under construction. Their rate was almost P100,000 for an evening event back then. So, I told myself, this is waaaayyy out of my budget! It was not practical to spend P100,000 for a day's use of a venue. Then we came back to Fernbrook Gardens after our Intramuros ocular. We were amazed at how it shaped up. It's majestic and grand. PROS: Great architecture. Definitely the hottest wedding venue today. Convenient because ceremony and reception venue are in one place. CONS: Construction of 5 more venues are on the way, soundproofing not yet fully operational - hopefully by December, it is! River inexistent. The Gondola is there though. Super duper expensive. THE VERDICT: We booked them last January 24, 2009 and opted to pay in full to get more freebies. We got Victorian 2 (300 to 350 guests cap) for P170,000 net. The freebies we got on top of their standard freebies are Aircon for Notre Dame de Vie Chapelle (normally costs P5,000), 4 lighted dance panels (normally costs P15,000), and Bridal limo or bentley (normally costs P15,000). That's P35,000 worth of savings for full payment. We also got a little discount because our wedding is a weekday. So far, she's been helpful with my queries. Medyo mahirap lang mahagilap. But that's ok, my wedding is still 10 months away! I have my eyes on Manila Cathedral for the ceremony. Architecture is great and this is I think the most famous church in the country. I love their long aisle. The Manila Cathedral administration does not accept reservation fee payment until the couple has attended their orientation - scheduled every Saturday. We visited the MC office last January and we pencil booked for the 3pm slot on December 23, 2009. We are scheduled to attend the orientation January 24. Rates of MC then are P28000 with aircon and P18000 no aircon. P8000 reservation fee required. Our next agenda was to see the reception venues near MC. Our shortlist includes Villa Immaculada and La Castellana. We want an indoor reception so that our unpredictable weather won't be one of our worries. First stop is La Castellana. Located just behind Manila Cathedral. I was almost certain to book this venue based on the photos. But when I saw it, I didn't feel it was the venue for us. PROS: Very new. Interiors are good. Very convenient if ceremony is in MC. Owner is very nice. CONS: L-shape. No aircon. I feel there's no sufficient space. Rental rate is P60,000 on weekends and P50,000 on weekdays. Located at the back of Manila Cathedral. Exclusively managed by Tamayo's Catering. I also almost booked this venue because it's the most convenient venue for us if ceremony is at MC. CONS: Looks old, Villa Immaculada hall is small for 300 guests. I saw a wedding with 200 guests and I think it's crowded na. Package starts at around P180,000 for 200 guests. So, we left Intramuros confused. Not one of the reception venue gave us the "this is it!" feeling. Then we thought of checking out Fernbrook Gardens. It's just a 15-minute drive from our place. 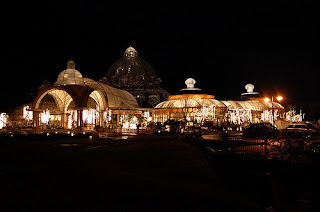 We went straight to Fernbrook after our Intramuros trip. Our Fernbrook ocular in my next blog. Aside from renting out inflatables for kiddie parties and events through my Jared Inflatables site, I also sell stuffs online through my Love Shoppe by Chi store. I also list items in eBay. I import stuffs - mainly bags, wallets, tees, sandals, and kiddie stuffs - and I sell them here. The fastest to sell are the bags and wallets, especially Liz Claiborne and XOXO stuffs. They sell fast that I always forget to leave one item for myself... Huhuhu. So let me share some experiences I had with this endeavor. A buyer inquires about a bag. She asked me: "Sis, sa tingin mo di sya maliit for me?" I really hope I have super powers to see her and be able to tell her if a bag is small for her. A buyer paid for a bag. She tells me: "Sis, ship mo today ha and make sure I receive it tomorrow morning, half-day kasi kami sa office." Sana rin I own the courier company so I can tell them to prioritize my shipment and deliver it first thing in the morning. Whew! Buyer already bought 3 bags from me. Then she wants to buy another bag but she said she'll pay for it in a week's time. The trusting person that I am, I shipped the bag to her without the payment, relying on her word that she'll send the payment in a week's time. And yes you guess right! I did not receive payment for more than a month. She canceled her multiply account and she did not answer any of my phone calls. Yes, it's my fault! So, lesson learned: never ship an item without payment! "Sis, nawala na yung tag eh, pakitanggal na lang din yung tag nung sa Size 10, ok lang kahit wala ng tag i-send mo." This is it! December 23, 2009! Finally, our wedding date is set on December 23, 2009. It used to be December 23, 2008 but did not push through due to an issue with my father. So finally, he gave his blessings when we asked him January 2009. As long as it is December 23, I am happy! Wedding preps mode again! I started wedding preps way back in 2007, for the 2008 wedding. Has been a w@wie since then. So now that I am back on my wedding preparations, I kind of already have an idea of suppliers I like. Jardonyx and I, together with our son Jared, are now ready to face the Lord and give our commitment to love and cherish each other, to love and take care of our family, and to strengthen our faith to Him. "HE" know how much we wanted this from the very beginning, after more than three years since our son was born, the plans of marriage is now starting to unfold. I think the three years of living together now makes us a hundred and one percent sure that we are the "one" for each other. Not that I am advising you to do the same, it's not a walk in the park and we sure did face a lot of challenges along the way. Those challenges made us stronger as a couple. The exciting part now is the preparations for the BIG DAY! I see our wedding as the BIGGEST project I'll ever handle. It's the best time to be "OC," oh yeah! 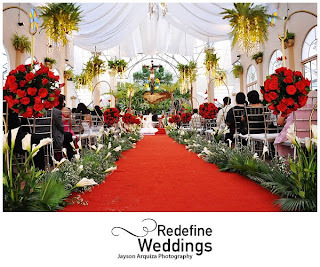 The wedding day is the culmination of all the hard work during the wedding preparations. It's not really just the wedding day for me, it's the whole experience of preparing for it. This is oh so exciting!